It’s always been a head-scratcher for me — this obsession that some people seem to have with pitting various viewpoints on the Atonement against each other, as if they are mutually exclusively (and therefore bitter enemies). I’ve always seen them more as the differing sides of a finely-cut jewel. The essence of the jewel is the same — Jesus Christ’s saving work on the Cross — but as you rotate the gemstone, you see and appreciate different angles, refractions, and you marvel at its simple, yet complex, beauty. Plus, you can’t ignore that each viewpoint — regardless of how well articulated — has its own fair share of Scriptural support. To use just one viewpoint as an example, you can’t escape the ‘substitutionary’ language of the Bible without having to pretend certain verses don’t exist (or engage in dubious mental and hermeneutical contortions in an attempt to make them go away). Just the other day, while researching for a new book that I’m hoping to write, I came across a collection of videos at “Three Minute Theology”. Instead of my metaphor of a jewel, the creators of these videos chose a Prism, which I like even better. 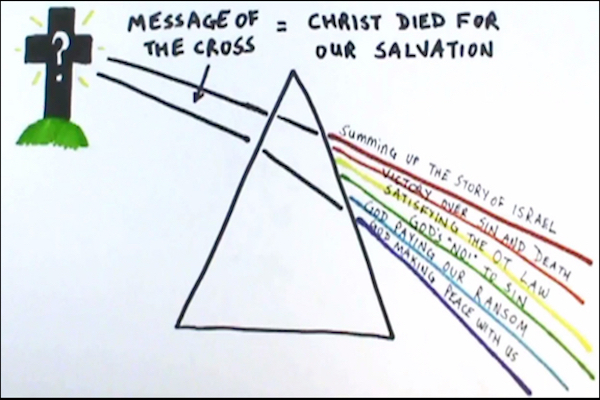 Three Minute Theology does not pretend that it’s possible to exhaust all the nuances of the topic in bite-sized morsels, but these videos provide a fantastic overview of the various sides of the jewel, or — in this case — the different hues found in the Prism of Atonement. These short hor d’oeuvres will whet your appetite. Enjoy!